Make a novelty box for Valentine's Day in the shape of a heart. 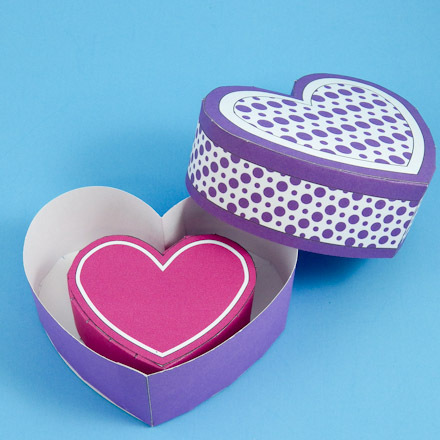 Choose from a variety of printable patterns for three sizes of heart boxes—sized to nest together or stack. This is a cute gift box for small presents that will bring smiles and warm hearts wherever it is displayed. This box uses the banded box technique presented in the Oval Box with Lid craft project. Tip: Make the Oval Box with Lid first to learn this technique. Related craft: If you are intrigued by boxes with novelty shapes, see the Christmas Tree Shaped Box project, and design other box shapes by following the instructions at the end of that project for how to create a box pattern with a shape of your own design. Choose a box to make. Download and print the pattern. The smaller box (2¾" by 3¼" by 1½") and little box (2½" by 2¾" by 1") patterns includes both the box bottom and top. The large box (3¼" by 4" by 1½") requires separate patterns for the bottom and top of the box. 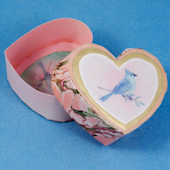 The Heart Cutouts pattern offers additional box top and bottom choices or use them as box liners. Make a lightweight box by printing directly on cardstock. For a stronger box, print a black and white pattern on computer paper, and trace or transfer the pattern to cardboard before proceeding. Larger Box: The side strips for the larger box are in two pieces. Glue the two pieces together, using the glue tab to join them. With a ruler or straight edge, make a score line along the bottom of the tabs on the side strip and on the glue tab line. For the smaller box, score across the side strip between the 9th and 10th notches—marked in red on the illustration below. To score: Turn the side strip pattern with the marked lines up. On cardstock, use the bone folder or empty ballpoint pen to make an indent—not a cut. If you are using light- to medium-weight cardboard or poster board, use a straight edge and a craft knife or scissors to make a half-cut. Fold the tabs over, then unfold them to about a 90° angle. Fold on the other scored fold lines. The center score line is placed at the tip of the heart. In preparation for gluing, bend the side strip around the heart-shaped cutout. Position the middle fold at the tip of the heart. If the side strip is too long, adjust it by cutting a little from one end. If the side strip is too short, cut the heart down a little. Coat the insides of the glue tabs with a thin layer of white glue. Apply a band of glue around the perimeter of one of the heart-shaped cutouts. Make sure that the band of glue is as wide as the depth of the tabs. Wrap the side strip around the cutout, pressing the glue tabs firmly in place along the sides, over the top and into the middle dimple. At the top of the heart, push the glue tab under the other end of the side strip and glue in place. Finally, glue the other heart-shaped cutout in place to hide the tabs. Repeat steps 1 through 5 for the box top. Optionally, glue the insets to the second heart-shaped cutout. You may cover the sides of the top with decorative paper or ribbon prior to gluing the second heart-shaped cutout in place. Cut a strip of paper the same size as the side strip. Glue the decorative strip in place, carefully aligning the edges. Cut glue tabs on the other edge, fold and glue over existing tabs. Decorate the box top however you like! Wrap a strip of paper in a coordinating color around the sides of the top. 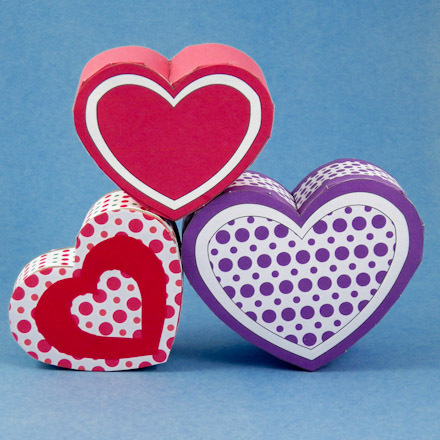 Use the inset patterns to cut out smaller heart shapes from decorative paper. Your box is now complete! What will you put inside? Tip: Download and print the Transparent Hearts digital papers in three colors: lavender, white and yellow. They coordinate with the card patterns in the Valentine with Pop-Up craft project. 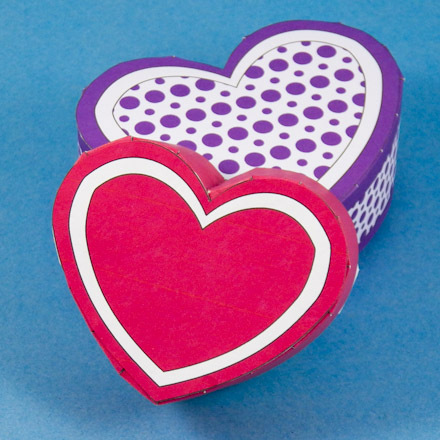 Use the papers to make heart insets for the heart-shaped boxes or Valentine's Day Cards. 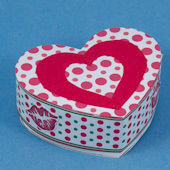 Tip: The heart-shaped box patterns come in three sizes—with and without dots. The inset patterns can be used to cut hearts for the top from patterned or plain paper. 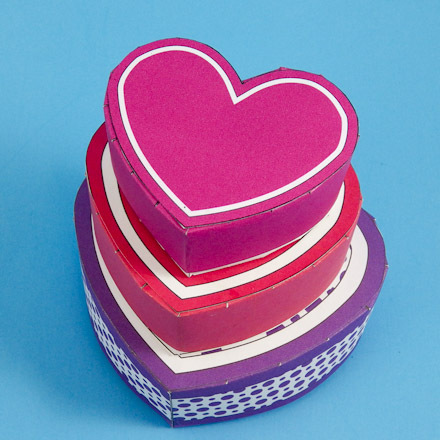 Tip: The three sizes of heart-shaped boxes are designed to nest one-in-another or stack in a tower. Tip: Use strips of patterned paper to cover the sides of the box and add cutouts of rubber-stamped images. Tip: The Wild Purple Dots, Wild Red Dots and Wild Green Dots ePapers can be used to make Valentine's Day Cards that match the sample boxes in this project. Tip: Print the black and white patterns on colored cardstock. This box is made from pink cardstock with a marbled paper strip glued to the sides. The inset patterns were used to cut a gold heart and an image. This box was then sealed with acrylic varnish to improve strength and durability.